Warrior is basically a box with a round turret, which has a little gun in middle, "ears" (ATGM cameras), and the ATGM launcher itself on the right side. Front of the hull is sloped, but it doesn't really help. On its right, there is an exhaust port, which may prevent gunner from firing precisely in Realistic Battles, but usually, it's not a problem. If the vehicle has Add-on armour, it's easily identified for its riveted plates on sides of the vehicle. Usually, after being shot with a high velocity round, they break off. Plates do not protect the rear of the vehicle. Practically, the Warrior is the only proper light tank the British faction has. It's mostly played as an aggressive ATGM tank or ambush scout tank, though it can fulfil any role that doesn't involve it being constantly shot at. It's best described as a hybrid between a slowed down SPAA and assault ATGM launcher, while armour is either nonexistent or installed via a modification to partially protect from hazards that normally annihilate light tanks. The weapon combo is potent enough to destroy even modern MBT's, and with add-on armour, the Warrior can bully even heavy tanks in close range, though the turret is still very vulnerable. The Warrior can be played defensively (mostly around hills and mountains), or aggressively (on flat terrains and in towns), given that there is enough cover for the Warrior. In realistic battles, Warrior can also hide relatively well and use either of its weapons to punish unsuspecting people, or just scout them. This vehicle is very easy to play while still in stock mode, as it has most essentials available at stock or unlocked early on, however, every upgrade only makes it even stronger. This box outside of warrior can sometimes block APHE from leaving the vehicle. On top of that, chemical rounds can also hit it, or construction below it and cause the hull to break. Warrior is well protected against heavy machine guns, however, it's a turret, back and even sides can be penetrated by 12 mm and 14mm HMG if shot correctly. Coaxial autocannons and low calibre SPAA penetrate turret and sides without add-on armour instantly. Due to armour being thick enough to protect from HMG, it will trigger fuse on almost every cannon shell in the game, unless it hits engine ventilation (which is extremely unlikely and bad on its own). As such, popular misconception of not using add-on armour to "increase the chance of over-penetration and move faster" should not be taken as a single truth. In fact, single APDSFS or APHE can annihilate Warrior easily by just scratching it, if it enters the vehicle at a bad angle. The most notorious weak spot is the little "box" just outside of warrior's rear. Not only it's not protected by composite add-on plates, but it may also force APHE ricochet inside of IFV and set off MILAN missile storage, exploding the vehicle in the process. The Warrior can be hull-broken by any chemicals with more than 35mm penetration. Due to its boxy profile, it often gets accidentally hit by ATGM's that were meant for other tanks nearby. To fix this problem to some extent, you can apply add-on armour modification. 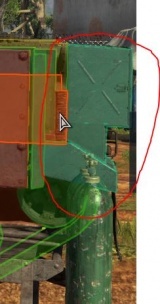 Protection analysis might get all weird with protection and damage values, but essentially frontal panel gives a 45% chance for the Warrior to not be destroyed from frontal HESH shot by just being there. Side armour does the same thing for the entirety of the sides but is weaker. Any stronger shells will likely obliterate Warrior from sides unless it was a grazing shot. 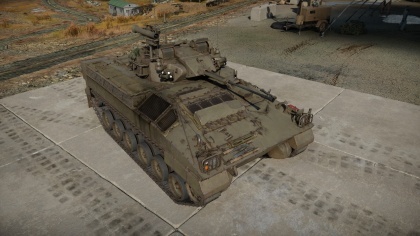 With Add-on armour, the Warrior can survive any machine gun fire, misplaced autocannon fire, close artillery miss, low-caliber SPAA fire, chemical shells and all the other things that normally cause hull break or annihilate light tanks, so the Warrior can play much more boldly and harass enemy if they are alone. It defends the sides and half of the front, with the frontal plate covering the driver. In case if it somehow saved the vehicle from a frontal shot, the Warrior will be very likely set on fire and have the engine broke, which may mean an impending knock-out if unable to retaliate, so keep that in mind. The front-right side does not have complete armour protection because it's expected, that engine compartment takes the hit for the vehicle, but in game, it cannot prevent hull break, caused by explosives even touching the hull, so try to face the enemy with the left side, if possible. The plates aren't immortal, so after being hit too hard they will break off, much like explosive reaction armour. The protection quality of these armour plates is most notable when compared to facing the BMP-2 (when it doesn't help at all) and the Begleitpanzer (when it actually saves the vehicle from grazing shots). Side armour plates can block HESH and some weaker forms of chemical ammunition with about 130-160 mm of penetration power, the frontal plate can save from about 220 mm of chemical penetration power, saving the light tank from hull break. If the shell is stopped, hull break is prevented at the cost of the protection panel. Any AP based shot, like APHE, will most likely go through composite lists unless it was a grazing shot. 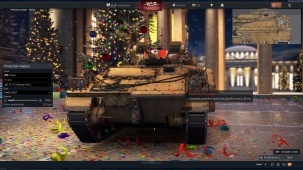 Because of this, it's advised to avoid directly attacking SPAA with 30mm guns, and other IFV, as those can destroy the Warrior even without special APDS ammo, and have guns with much higher rate of fire. Since this particular edge of Armour plates is invulnerable, ATGM destroyed the entirety of Warrior Armour, but Warrior survived. As could be seen here, armour on warrior is extremely random. The sharper the angle of attack, the bigger the chance of miraculous survival. Mobility is adequate on vehicle's BR, it can move forward and backwards equally fast, but don't expect it to be climbing mountains like with the Vickers MBT in Arcade Battles. It will just slide down if the surface is too steep. In Arcade Battles, it's generally driving at 46-54 km/h offroad in either direction without engine upgrades, regardless of additional armour. With mobility upgrades it may drive up to 60 km/h, but not very often. Speed of 81-83 km/h can be reached if the Warrior drove off the hill and keep driving forward, or on completely flat terrains, like roads in the American desert, though sometimes it just doesn't work again at the same spot. Accidentally hitting something on max speed, especially explosive decorations, launches the Warrior up to 5 meters in the air, which is very entertaining, but almost never fazes the enemy. Adding armour does not decrease Warrior's hp/ton significantly, and it only reduces maximum climb angle by 2 degrees, so it should be used when unlocked without worries of mobility penalty. First of all, one needs to understand that both of the weapons on the Warrior are useful. The gun is very slow firing, but with APDS belt it can penetrate the sides of most medium tanks and SPGs. Basically, it's effective against medium tanks, but lacklustre against fast vehicles that have spaced armour. It can be used to hurt crew from over 1 km distance, but it's not very good at damaging enemy ammo racks, so it's best used to destroy engines, tracks and crew unless it's easier to hit. Proper heavy tanks are normally not fazed by its fire at all, but for them there is the powerful MILAN launcher, which can penetrate them even from the front with its 580 mm penetration power, leaving them completely disabled. 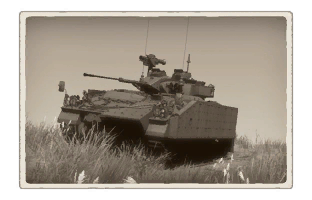 In a perfect world, even in the worst situation, the Warrior can still use its 30 mm gun to de-track charging enemy tank and instantly destroy it with side shot or ATGM, but it's not very likely that the Warrior will live that long. Also, in a worst case scenario, the 30 mm autocannon can be used to try and shoot down planes with it, but it will require skill with slow-firing SPAA (like the Crusader AA MK I), and any plane coming down at a high angle can't be engaged. Not convinced? The main gun can still remove any trees and solid fences at any range, which is normally a nightmare for any other British ATGM vehicle. This belt can be used against other light tanks and certain lightly armoured medium tanks. However, it also includes anti-air round (HEI-T), which does increase damage to air targets but is useless against tanks at rank 5. The low rate of fire of Warrior doesn't compliment this dual belt. (Armor piercing discarding sabot) shells This belt can be used against sides of most medium tanks of rank 5 and 6, and even some heavy tanks can be damaged by it. Performance of this belt deteriorates much slower than of AP-I belt, but it does less damage the more armour it had to penetrate, resulting in an inability to set off enemy ammo racks in 1 hit if it was behind any good armour. If used against planes, it can damage or rip off wings, or snipe out the pilot. Warrior carries MILAN missiles as a secondary weapon. The MILAN missile itself is launched at absurdly high speed in contrast to Swingfire missiles while retaining good control. This makes it very hard to dodge up to 700 m range, but harder to turn it into enemy cover, especially horizontally. However, it can be launched above small obstacles and flat hills, if the enemy is far away enough. It can be used in general melee range, but cannot be fired point-blank (10 m or so), and if not careful it can overshoot (look at launcher itself in Third-person view to avoid this). It cannot be used for super-long range attack, as it's maximum range is just 2 km. MILAN launcher can be upgraded to the MILAN 2, which has an absolutely insane 730 mm of armour penetration. Needless to say, it simply disintegrates or cripples the target tank that doesn't have chemical armour, unless the missile somehow hits the enemy gun barrel. The Warrior also cannot be flanked, unlike normal ATGM launcher, since its weapons are turret based. Despite being launched at their max speed, they are still very manoeuvrable, so they still can be curved behind some hills at targets ~500 meters away, and generally targets up to 800 meters can't dodge it. The machine gun is kind of useless for Warrior, but it can still destroy weak fences, which normally slows any tank down if they hit them, and it makes much less noise than the main gun. For enemy marking purposes, Scouting should be used instead, as it doesn't reveal the vehicle. Generally, Warrior needs to quickly get into the medium range of the expected enemy, then figure out its strategy for the current battle. While moving towards an objective, Warrior should keep a low profile and scout every enemy it can notice. After looking around, Warrior either takes some hills or well protected hull-down position near to capture point to utilize ATGMs and scouting ability for medium range attacks and team support, or takes an aggressive approach and goes for stealthy flanks and close range combat. It's not rare to see Warrior try and destroy heavy tanks, which just don't expect the light tank to go at them. 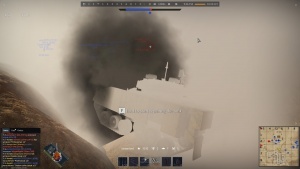 If forced, Warrior can always use a smoke screen to disrupt enemy plans of taking it down, either baiting them to waste time looking for it, or using smoke screen, MILAN-2, scouting and add-on armour together to attack the enemy from the fog with little fear of being punished for it. For some reason enemy does not often reply to ATGM shots but instantly fires back at cannon fire, so use cannon sparingly during this. Example of using smokes and armour offensively in arcade battle. Not only enemy is blinded and can't hold the line, allowing the team to rush in, but even if they fire towards the Warrior's general direction, they will likely load HESH and fire at the hull, hitting the add-on armour and doing no damage. MILAN-2, on the other hand, is almost unblockable and does fatal damage, and the player can clearly see the direction they are in due to scouting. A skilled Warrior can take out up to 2 tanks per 1 smoke deploy like that. Works on any range from 30m to 800m. Since the MILAN ATGM can instantly destroy or cripple anything, even seeing just the name of enemy and type of tank through smoke is good enough for the Warrior to have a chance for a hit. In realistic battles, it's less reliable, but the Warrior can still see where the enemy is. For light tanks, the 30 mm autocannon can work just fine (just don't do that against BMP; unless it already spotted and scouted the Warrior, it's not worth it). In Arcade Battles, If the "intelligence" reward is obtained for marking enemy that was or is invisible to teammates and then got destroyed, the player will get artillery support point and airstrike point. If the squadmates destroys the marked target, the player will get airstrike point regardless as a squad assist. Due to this, in 9.0 arcade battle warrior can call in ATGM helicopters on very first minute of a fight, simply by marking 2 enemy vehicles and destroying someone with an almost undodgeable and unblockable missile, while the enemy cannot even request gunships to protect themselves from it. ATGM helicopter than can destroy 6 to 10 enemy tanks, significantly weakening the enemy team. As the game goes on, Warrior can join multiple air battles in a row as second attack helicopter or bomber, because it's a scout vehicle. Since MILAN has relatively good controls and there is 8 missiles total, the Warrior can try and fire it above hills and guide it down on people, much like Swingfire and Striker. It's harder to aim at the enemy without a straight visual firing line, but if it hits anywhere important, they could be knocked out anyway. Since the Warrior is considered a scout vehicle, mark them and ping them on the map, even if a shot lands a hit. In Arcade Battles (AB), it's best to fire the missile at tank's gunner, so in case if it didn't destroy the tank on its own, the Warrior can just circle around the enemy and use the main gun to destroy the engine, then proceed to incapacitate the crew. In Realistic battles (RB) even taking out cannon barrel or breach might be enough, as repairs in that mode take much more time, and field repair doesn't even guarantee, that gun won't just jam itself again or fire in a completely different direction. Usually, MBT's will carry AP ammo as their first shot, which may just over penetrate and maybe do almost nothing. So if there is an absolute must directly attack someone, attack them, SPGs or other non-Soviet light tanks. There is also a trick related to the Warrior - if baiting an enemy that is looking towards the Warrior, pull the Warrior's rear end out of cover first. Since the rear has very little critical components outside of the MILAN missile stowage, usually being shot there doesn't do anything too drastic for the overall tank health. After being fired at, drive out of cover and fire back at them. This trick probably won't work twice, indicating you should make the most out of the opportunity you have at hand. Nobody likes to be shot with ATGMs and the second shot coming will most certainly be HE of some kind. This tactic may backfire if your IFV gets shot with APHE, or APDSFS will enter the vehicle at a bad angle, but those types of ammunition have the potential of instantly destroying Warrior regardless of the entry point. Any Soviet light tanks: Destroy it with ATGM, use scout ability to see when they are trying to leave their cover, use gun adjustment to never miss, generally never play around with them. BMP-1 will just hull break the Warrior, BMP-2 will just turn on full auto mode and unload half of its magazine into its target, even if it misses its ATGM, just to get rid of a threat and even add-on armour won't save the Warrior at that point. Oddly enough, the infamous Object 906 is probably the least dangerous of them, but it will still destroy the Warrior with proper shot placements. If the Warrior is spaded in modifications, just call artillery strike on them. IS-7: Do not ever engage this thing frontally without MILAN 2 and add-on armour. It is also extremely risky to attack it on a narrow street. Fire at the right (their left) side, to disable its turret. The main goal in engaging this tank is to disable its engine with the 30 mm gun and then blow it up by destroying its ammo in back of a turret or just blowing it up by firing ATGM in the middle of it or into ammo rack, if there is a spare ATGM (the IS-7, as a threat to any BR below 8.0, should be prioritized with every missile in the Warrior's capacity). Even the many machine guns on the IS-7 can shred the Warrior apart. Any tank with heavy machine guns: If possessing the add-on armour modification, simply avoid turning the rear towards them, otherwise the weak rear armour would be easily penetrated. Weaker machine guns of around 7.62 mm calibre can't penetrate the Warrior armour at all, and even 14,5 mm will have some problems penetrating the front of the hull and protected sides, so just destroy them by returning cannon fire and avoiding being hit in the turret. They'll never see it coming. If it tries to spook away a threat by being ominous and peeking over hills, disable its ATGM camera (on "ears") with concentrated fire if a direct hit to the crew and modules is not possible. Keep in mind that must damage whole IFV really hard for ATGM repairs to take long (otherwise it may take less than rearm time, which is not good). If the missile is already homing towards a vehicle with no way to break visual, try to get outside of direct missile control range (which will make missile spiral crazily and possibly missing by a centimetre) or face it with the gun barrel in hopes that it would absorb the damage and not cripple any critical modules. Never fire pure AP rounds to the back of this tank, since unless it hits one of the missile ammo racks there, it will just do nothing to it. If the Warrior has the add-on armour package, do not underestimate it and use anything possible when engaging it, not just HMG. Warrior repairs and reloads fast enough to disable its adversaries, if it must, just set it on fire is not going to stop it. Low calibre machine guns are useless against hull from front, despite it having incomplete add-on armour protection. The warrior can be destroyed by a fighter jet. However, do not just strafe it directly, as it actually can fire back and may have armour. It's best to attack it from the top. The FV510 infantry fighting vehicle was developed as part of a program to create a modern IFV for the British army at the end of the ’70s. The vehicle went into series production in 1986. The vehicle was equipped with 30 mm gun, fed by magazines of three shells each. This gun was designed to destroy lightly armoured vehicles with maximum accuracy. For the Desert Storm operation, the Warriors were equipped with Chobham passive armour – add-on armour plates that significantly improved the IFV’s defence in battle, allowing it to survive a hit from an RPG-7 grenade and shrapnel from high-calibre HE rounds. A little later, in 1990, the military decided to equip the Warrior with anti-tank weaponry – a 30 mm gun for these targets was clearly not enough. The roof of the turret was equipped with a launcher for the MILAN ATGM. The commander used a hatch to fire the ATGM, and it was reloaded through the upper hatch of the armoured vehicle’s infantry compartment. The FV510 Warrior is still in service with the British army and is the main IFV of the United Kingdom. Confusion and destruction tactics with the Warrior. This page was last edited on 22 April 2019, at 22:57.